Each spring the New York State School Music Association (NYSSMA) runs solo and ensemble festivals that allow students of any age to prepare a piece of music and perform it in front of an adjudicator. The advantages of this festival are that it allows the student an opportunity to learn a quality piece of instrumental or vocal literature and develop proper technique, style, and begin to build a repertoire of music for performances. Students then perform as a soloist for an adjudicator - which is one of the National Standards for Music. The adjudicator scores the students based on predetermined criteria and that score is used to as one criteria in the nomination process for SCMEA All-County ensembles the following year. Students may prepare NYSSMA solos on their band or orchestra instrument as well as voice. NYSSMA participation is highly encouraged to help the students grow musically! The NYSSMA performance should be positive and joyful. In order to ensure that students that participate in NYSSMA are truly ready for the challenge of performing a solo in front of an adjudicator, students will first audition for Mr. Baur. 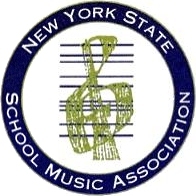 Students will receive information about NYSSMA in January of each school year. East Islip MS on May 16, 2019.